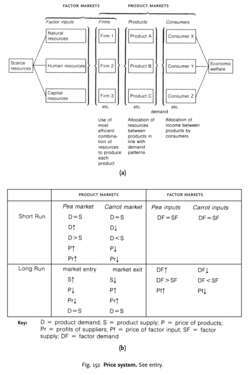 A characteristic of an economy in which basic decisions about what to produce, how to produce it and how products (income) are to be distributed are determined by the interaction of buyers and sellers in product and factor MARKETS, as indicated in Fig. 152 (a). In a PRIVATE-ENTERPRISE ECONOMY, or a MIXED ECONOMY with a significant private sector, the current levels of output and consumption of products are the result of the varied decisions of households and firms being put into operation through the price system as they carry out transactions in markets. The firm is a key element in the market system operating in product markets, where it sells products, and factor markets, where it buys or hires resources. The price system embraces both types of market and broadly operates so as to ensure that resources are allocated in accordance with consumer demand. For example, suppose initially that carrot and pea prices were such as to equate supply and demand for these products in their respective markets but then there was a change in consumer demand away from carrots and towards peas, as indicated in Fig%. 152. The increased demand for peas, coupled with unchanged pea supply in the short run, would result in an excess demand for peas at the prevailing price, and price would rise to ration the scarce peas amongst consumers. The decreased demand for carrots, coupled with unchanged carrot supply in the short run, would initially give rise to an excess market supply at the prevailing price, and the price of carrots would fall as suppliers seek to clear unsold stocks. These changes in prices will affect the profits of carrot and pea suppliers. As demand and prices rise in the pea market, pea growers will experience increased profits, while carrot growers, faced with falling demand and price, will find their profits declining. Over the long term, pea producers will invest in additional land and machinery and hire more labour to expand supply, and new firms will be tempted by high profits to enter the pea market. The resulting expansion in pea supply will force high prices back down to a lower level, leaving firms producing peas making NORMAL PROFITS, at which level there will be no further incentive for new firms to enter the pea market or total supply to expand. By contrast, as demand and prices fall in the carrot market, suppliers will find their profits falling and less efficient producers will go out of business as they experience losses, while other producers will curtail their carrot output. The resulting decline in carrot supply will continue until carrot supply adjusts to the lower demand and firms left in the carrot market are earning normal profit. Changes in product markets will have repercussions in factor markets, as Fig. 152 indicates. In order to expand pea supply, extra natural, human and capital resources must be drawn into pea production, and this can be achieved only by offering them a higher return than they receive elsewhere. The increased demand for peas will result in an increased derived demand for FACTOR INPUTS in pea production, and this excess demand for factor inputs in the pea industry will increase the returns to factors employed there. By contrast, the carrot industry will be releasing resources as firms leave the industry, and unemployment of factors of production in the carrot trade will reduce factor returns as the derived demand for them falls. These forces serve to shape the distribution of income between those working in pea and carrot production. The above example shows how the price system results in a reallocation of resources in response to signals given out by consumers about their changed demand for products, which in turn affects the prices of factor inputs. However, autonomous changes in the prices of factor inputs can themselves affect product prices and consumer demand patterns through the price system. For example, assume that carrot production is a relatively labour-intensive process while the growing and picking of peas is highly automated. Consequently, a sharp upward shift in wage rates would affect the two industries differently, the cost and price of carrots rising substantially while pea costs and prices change little. Since carrots are now more expensive while peas are much the same price, consumers will tend to alter their consumption patterns, buying fewer relatively expensive carrots and more relatively cheap peas. Consequently, output and employment in the carrot industry will tend to fall while output of peas expands, and a reallocation of resources from carrots to peas might be expected. The process of reallocation may be more direct than this though, for, as firms seek to produce carrots at minimum cost through the most efficient combination of factor inputs, faced then with an increase in wage rates, they will alter production methods, using fewer relatively expensive labour inputs and more relatively cheap capital. Increasing wage rates are thus likely to accelerate automation in the carrot industry, reducing the demand for labour there. The price system can provide a sophisticated mechanism for allocating resources in an automatic way. However, it is not necessarily as perfect a resource allocator as it may appear, and various MARKET FAILURES may affect its efficient operation. First, the response of supply within the price system to change in consumer demand may be very slow and painful because less efficient firms are not eliminated quickly but linger on, making losses. Second, resources are not always as occupationally or geographically mobile as the model implies, especially where workers require significant training to acquire appropriate skills. Third, the price system cannot ensure the provision of certain COLLECTIVE PRODUCTS, like defence, which are enjoyed in common by all consumers because no markets for such products exist. Fourth, the price system takes into account only the private costs incurred by suppliers in producing and distributing products, ignoring the SOCIAL COSTS of pollution EXTERNALITIES. Finally, the efficient functioning of the price system depends crucially upon the structural characteristics of product and factor markets. With PERFECT COMPETITION in product and factor markets, the price system might well operate along the lines of the previous example. By contrast, where markets are characterized by MONOPOLY or OLIGOPOLY, with high BARRIERS TO ENTRY and BARRIERS TO EXIT, then firms are not free to enter or leave product markets at will in response to profit opportunities. For example, if our earlier pea market was dominated by a monopoly supplier, then, faced with an increase in demand, the monopolist may decide not to expand pea supply but rather to exploit the increased demand by raising the selling price. Consequently, in the long run the monopolist earns above normal profit and no extra factor inputs are devoted to pea production as consumer demand requires. See CENTRALLY PLANNED ECONOMY, THEORY OF MARKETS, CONSUMER SOVEREIGNTY, REVISED SEQUENCE. And like the air providers, the carrier price system becomes the system of record for auditing. FRANCE'S minimum retail price system for cigarettes is to be challenged as illegal under European Union (EU) free trading laws by the European Commission. If makers were to establish new transaction rules to replace the quoted price system, this could be expected to permeate the entire industry in a short time," Aoki writes in a recent research report. Vietnam Airlines is to revoke its two-tier price system for Vietnamese and foreign passengers. In a recent contribution to this journal, Nancy Ruth Fox (1996) compares the efficiency of a first come, first served (FCFS) allocation system for morning kindergarten with both a price system and a modified market system. Coase asserted that firms arise as a way of economizing on the inevitable transaction costs of the price system. The Commission's Directorate-General for Competition, DG IV, studied the effect on trade between EU Member States of the Dutch fixed book price system over the last year. In assessing the assertions made by management relative to the system's internal controls, Deloitte & Touche concluded in its written statement, "Management's assertion that (Ashton's subsidiary Universal Trading Technologies Corporation, UTTC(TM)) UTTC maintained effective control over the Volume Weighted Average Price System as of July 2, 1999 is fairly stated in all material respects. A deal has been signed by PRICE Systems with QinetiQ to execute the QinetiQ Family of Advanced Cost Estimating Tools (FACET) as part of the PRICE Cost Analytics framework. The MEPs are thus recommending a Directive that would confer on Member States the right to introduce or maintain fixed price systems for books in its territory. PRICE Systems designed its training courses to enable PMPs to quickly and accurately assess schedule, cost, and risk while considering all available alternatives, which improves outlooks for complex, high-visibility programs and businesses seeking competitive differentiation. WHO: Government Accountability Office (GAO) Senior Cost Analyst and developer of the GAO Cost Assessment Guide Karen Richey, PRICE Systems Senior Director - Government Solutions William J.